Genre : Indian YA Fiction. Is it going to be like Hum Aapke Hain Kaun? What a sweet little story! 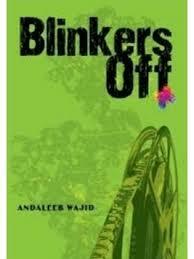 Blinkers's off is possibly the first Indian contemporary popular fiction I have read which has a Muslim protagonist- which was extremely appealing to me. I am not going into the plot as the synopsis does a good job of it and if I am going to outline the plot , it will pretty much be repetitive. What I am going to talk about is the freshness of the book. I read it in a couple of days , and that is saying a lot considering the fact that I normally take a few weeks to finish any book. Blinkers off is fast , breezy fun book that will remind one of their college days .It is essentially a love story (a love triangle at that ). There were other reasons why I wanted to read this book.I was intrigued about how a Muslim protagonist would think. No different from anyone else , but still I wanted to read the book mainly for that. Secondly , the part about the protagonist filming a movie at a wedding also got me all curious about how the subject would be tackled. Story-wise , it was pretty straight forward with all the expected misunderstandings that are the staple of any book that deals with Young adult love. No flowery language or complicated writing , just simple story telling.This , I feel is the biggest strength of the book. Noor is an extremely likable character, despite all her hang-ups and insecurities , while Dennis is the quintessential Alpha male archetype that any girl would swoon over. From the supporting cast , I liked Nandita's charecterisation the best and could somehow not tolerate Noor's mother. I found her extremely harsh and critical . Oh, I also loved Roshan ( Noor's know-it-all kiddo brother). Supriya, the supreme snob does her job well and makes us hate her from the word go. Overall, a sweet little book that is breezy and fun. This book was like a bowl of khichidi and ghee for me - comforting and soothing, with no major twists or complicated writing. Next time when I am looking for a breezy fun book , I know I'll consider Andaleeb's other books ( She is really prolific and has had a book coming out every year). Thanks Uncle OT for introducing me to this author's book. That was such a nice review; depend on you to express lucidly exactly what you feel. Thanks. he he .. Just saw this comment..